Ceremony honors environmental pioneer and celebrates the first college at UC Santa Cruz to be named in 35 years—and the first named after a woman. 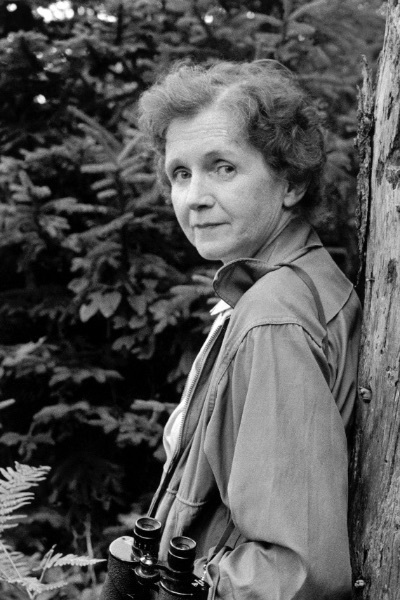 Rachel Carson is best known for her book, "Silent Spring," which sold millions of copies and brought widespread attention to the harmful effects of DDT and other chemicals. The dedication ceremony drew an enthusiastic crowd of supporters to the campus. In 1972, a UC Santa Cruz college with the theme of "environment and society" opened with distinguished professors, socially conscious students, and a mere number for a name: College Eight. 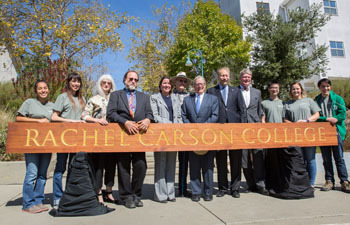 That changed for good—and for better—on Thursday with the dedication of Rachel Carson College, named for one of the great environmental prophets of the 20th century. This is the first college UC Santa Cruz has named since Porter College 35 years ago. The naming also addresses a longstanding oversight in the current group of names for UC Santa Cruz colleges. In fact, as another speaker mentioned, Rachel Carson College is the first college across the entire UC system to be named for a woman. Carson, a marine biologist, is best known for Silent Spring, published on June 4, 1963, and completed while its author was in her mid-50s and dying of breast cancer. The author William Souder, a recent biographer of Rachel Carson, spoke on campus the evening of the dedication. He has described Silent Spring as s a “cleaving point” when the “gentle, optimistic proposition called ‘conservation’ began its transformation into the bitterly divisive idea that would come to be known as ‘environmentalism.'" The New York Times, in a 50th anniversary retrospective, said the book’s oversized if unintentional influence on the environmental movement is comparable to the impact of Henry David Thoreau’s Walden. Silent Spring presented a view of nature that was shocking for its time—a nature that was far from a pastoral Eden immune to the actions of human beings. Instead, she portrayed a compromised nature where synthetic pesticides, such as DDT, held sway. Instead of just destroying their intended targets, such as fungal blights or insect pests, these synthetic chemicals made their way into the food chain, wreaking havoc especially with bird and fish populations but threatening humans as well. Carson placed a strong emphasis on the way DDT often caused birds to lay weak-shelled eggs that shattered too early, decimating populations. Not surprisingly, birds were a constant reference point at the dedication ceremony. Speaking of birds, Blumenthal mentioned the way UC Santa Cruz scientists and their students have responded to Carson’s work with their own research, intervention, and advocacy. He noted that the campus played “a definitive role” in saving California’s peregrine falcon population from DDT-related decimation. Blumenthal mentioned UC Santa Cruz biologist Ken Norris, who teamed up with Santa Cruz veterinarian James Roush to form the Santa Cruz Predatory Bird Research Group. In 1970 there were only two falcon pairs left in California, but the research effort—which involved perilous cliff climbs as well as recovered and incubated chicks—was such a success that the falcon was later removed from the endangered species list. It establishes an endowment to ensure the college can provide research and educational opportunities for students in perpetuity and establishes a chair in ecology and environmental justice. Concurrently, citing the impact of Carson’s writings, a chair in science communication is also being created. The gift package totals $7 million. “We could not think of anyone who would better embody the core values of UC Santa Cruz than this environmental pioneer,” said Alec Webster (Rachel Carson College '02, environmental studies), who attended the ceremony with his wife, Claudia. He mentioned that Carson had to overcome sexism and poverty, and grapple with illness, along with a constant threat of potential litigation, to get her message out to the world. Just before the ceremony began, Jessica Schere (Rachel Carson College ’19, bioengineering) talked about the various ways Carson continues to influence students. “My whole (first-year) core course revolved around Carson,” Schere said. “She was the first name that came to mind when we were talking about a name change. And I know several students who feel the same way. We are very passionate about Rachel Carson."